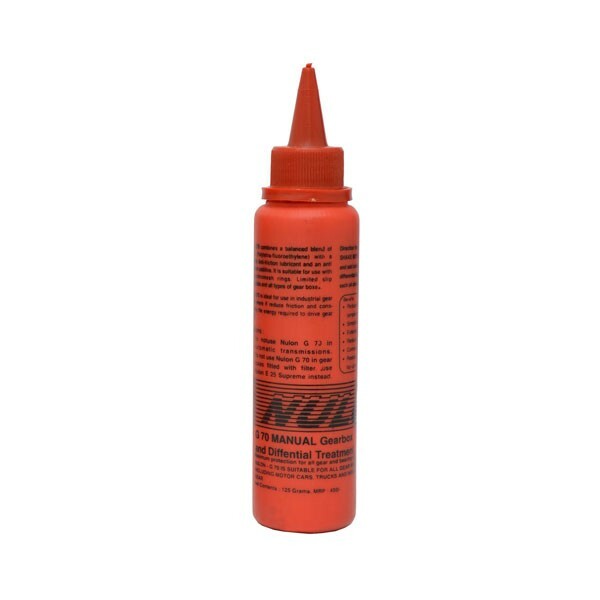 Nulon G-70 combines a balanced blend of PTFE with a synthetic anti-friction lubricant and an anti-corrosion additive. It is suitable of use with all synchromesh rings, limited slip differentials and all types of gear boxes. PTFE is the slipperiest substance known to science which provides the lowest co-efficient of friction thereby enhancing performance. The transmission of a vehicle is normally neglected by users although both the gearbox and differential bear the brunt of the vehicleâ€™s load. Conventional and mandatory gear and differential oil need to be further supplemented by high quality lubrication which enables vehicles to perform beyond their rated capacities. When added to the gearbox or differential, G-70, dramatically and immediately improves vehicle performance by. Reducing friction in the gearbox and differential. Providing a cushioning effect to the mating teeth of the gears. G-70 impregnates metal surfaces and provides residual lubrication leading to long lasting benefits that no other gear and differential oil can provide. G-70 is also suitable for use in all types of industrial and marine gear boxes, as it reduces friction and consequently the energy required to drive gear boxes. Industrial applications include, Worm Reduction Gears, Bevel Gears, Spiral Gears, all Synchromesh Rings and Limited Slip differentials. Protection against corrosion of bearing surfaces. All Cars consume 1 Bottle of 125gm in Gearbox and 1 Bottle in Differential. Industrial and others 4 to 5% of the gear oil sump capacity. Shake bottle vigorously for 2 minutes and add full contents to gearbox and/or differential. For maximum benefits, repeat applications with each major service.